jsinajeep wrote: I hope that know one get pictures of the guy that drove that reck out of the desert. Yes Jerry we have proof YOU drove her up and out ,and did a fine job of it.Considering running out of gas,when she had a full tank.old doors that just didn't latch any more. The dash is done,a/c is left to install but need to get some help with that no biggy. Did some work on the valence had the standard upwards dent under the front marker even though it would be hidden by the bumper it had to go. We also got alittle rain here yesterday. Purple Rain that is. I have to admit, I like that purple. My dads CJ5 will get painted my version of the original "Plum" it came with. Heck, even my old High School colors were Purple and Gold. Is Pheobe Too getting stock bumpers or custom? Krista BB was asking me yesterday with the gleam in his eye! Jeff have to agree on the purple it's growing on me. Bigun at this moment To my knowledge we are going with the stock bumpers,But there is steel just laying around to build some! Another little mod done to P2 is the front grill wings added. Thanks Jerry the templets worked great. Just awesome! I am tickled to death with how she's coming out! Had a nice talk with Bob this morning and I have confirmed that she's keeping her chrome three piece bumpers! jeepstress wrote: Just awesome! I am tickled to death with how she's coming out! Had a nice talk with Bob this morning and I have confirmed that she's keeping her chrome three piece bumpers! I think Craig was going to offer a pair of his BlackBart Zombie mashers, they only add about 200 Lbs to the vehicles weight! Alittle look at what's to come.Nothing but glass on the bar just got to wait to get it out in the sun. That purple is PERFECT! I'm in love!!!!! I love that SHE is in Love with it Bob. Your work is so appreciated! Got to do alittle work with this tool today,can anyone guess what it is? Hers: 1987 GW - Shiny, new 360/727/NP229 - 31" Falken Rocky Mountain ATs and rust. Yep wanted to straighten out the a/c fins. Just tring some idea's out what do you guy's think? Oops! I wish you had mentioned where you were thinking about doing that Bob! We have the Jeep dart badges that are supposed to go there. 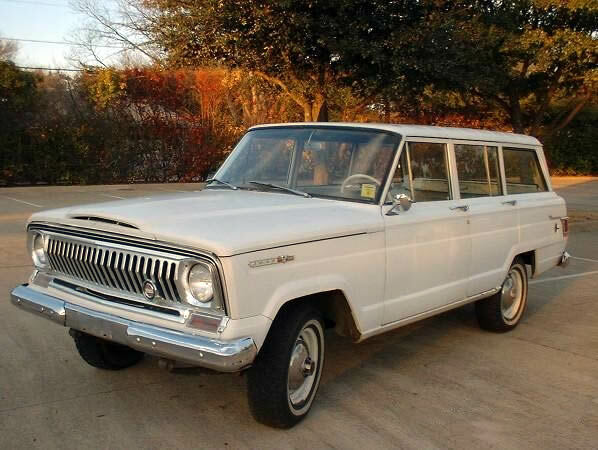 She's supposed to get both the front and back badges of this vintage (altho the back Wagoneer badge will be centered in the stripe instead of on the bottom). It's a damn nifty idea though! I still want to go with the red 401 badges on the hood.